On the hillside above the farm of Fearnoch are the remains of a tiny and early chapel. Its dedication is unknown. It is 5.2m in length and 3.6m wide, and sits in the centre of a little enclosure (15m x 10m). All that survives of this ancient place of prayer are the footings of its walls and a rather tumbled enclosure wall where turf, flowers and bracken are encroaching. 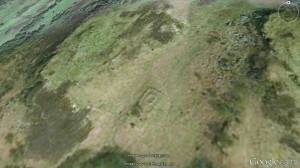 You can see the layout of the site from an aerial photograph – almost erased, the merest hint in the landscape. This chapel was presumably built to serve the spiritual needs of the community which farmed the land around here, the people of Fearnoch and the surrounding district. These people, after all, lived in Inverchaolain parish, but the church was a good distance away by land and sea. Even on a calm day, when the boat could be taken across Loch Striven, it would be a good day’s treck to get there and back. About 40m to the south-west of the chapel, further down the hill among the birch trees, there is an ancient well. It was formerly known as ‘Chapel Well’ or ‘Priest’s Well’ in English, but local Gaelic-speakers called it Tobar a’ Bhaistidh ‘well of the baptism’. The source of the water is invisible. It must spring up inside the pool, and it constantly refills it while water flows out of it, running in a little rivulet which pours out of the pool at its southern edge. 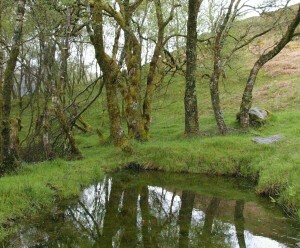 Tobar a’ Bhaistidh, ‘the well of baptism’, close to Fearnoch Chapel. That stone slab by its edge is probably one of the slabs that lined the well when it was still known and used locally as a baptismal well. In 1863 this well was recorded by workers from the Ordnance Survey, when it was quite small and well defined. It was said to be oblong, measuring three feet by one foot six inches, ‘its sides being formed by four flat rough stones’ (1). Since then the flat stones have been taken out (perhaps as part of a reworking to supply water to the farmhouse). The well has therefore lost its former definition, and has become more of a pool. The name of the farm on which the chapel and spring lie is Fearnoch, in Gaelic feàrnach, ‘abounding in alder trees’, although the trees around this well are actually birch. For an Ordnance Survey Map showing the chapel site and the surrounding area, including roads and footpaths, click on’Show Larger Map’ below. Park your car or bike in the layby at NS021770 on the A886, 2.8km north of Colintraive. Cross the road and walk 490m to the south keeping the summit of Meall Garbh (‘rough hill’) on your right, heading towards Cnoc Dubh (‘black hill’) whose rocky peak you keep on your left. Then, turning south-west, pass down the hollow between Meall Garbh and Cnoc Dubh. The chapel and the well are in that hollow, about 140m ahead of you.